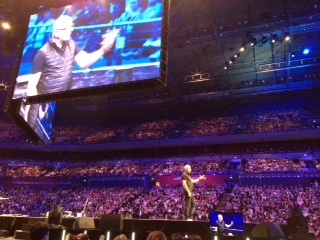 Hillsong conference, Australia's largest national conference, is in its 28th year, yet the goal has never changed. As Pastor Brian Houston of Hillsong church says, "the conference exists to champion the cause of the local church." After taking on the role of a delegate for this year's conference, I can say whole- heartedly that it does. The conference begins each day with morning sessions, titled 'rallies'. These two- hour sessions include creative performance, worship (often led by the breakout Christian rock band 'Hillsong United'), humanitarian initiatives, and the preaching of God's Word. Morning sessions are followed by panel- based teaching and 'master-classes' (small, focused sessions on a variety of topics). Particularly impressive is the diversity in subject- matter of the master-classes. A quick search of the conference schedule shows classes on virtually any topic related to Christendom, even the traditionally challenging, with discussions in areas such as prophetic worship, women in ministry, and triune theology. The conference's night sessions are free, and always begin with worship and include the preaching of the Word. These sessions have been described as "just like church but bigger" and in essence, they are. So, if they are basically large church services, why brave the lines and swarms of people to attend? After my experience as a delegate of the conference, I believe it lies in the atmosphere created by 20,000 worshippers all lifting up the name of Jesus simultaneously. The Bible says when two or more are gathered in agreement, God commands a blessing. I believe that this is the secret to Hillsong conference. Under the roof of the Allphones arena, Christians of every creed and culture unite under Jesus' name. In this enigmatic and rare experience of unity, the level blessing is unprecedented. Critics (of which there are many) may try to point to the lights or exceptional production as reasons behind the packed- out arena. This is not the case. Though the spirit of excellence is found in spades throughout every area of Hillsong conference, that is not what makes it beloved and highly- esteemed by Christians all over the world. It is that the name of Jesus is uplifted clearly and consistently year after year. There can be no confusion at Hillsong Conference that we are gathered under No Other Name but His. Tina Hakimi is an Arizona-raised, Sydney-based writer.